Profound conflicts mark the theology and practice of ministry in the Roman Catholic Church today. The affirmation of lay ministry rooted in baptism has left many priests and potential priests questioning their identity in the Church. Some lay ministers resent what they see as prerogatives and privileges accorded to the ordained. While some members of the Church are attempting to reclaim an identity for the ordained based on hierarchical and juridical powers, others are rejecting the very notion of the distinctive ministry of the ordained. Both lines of thinking betray the vision of Vatican II and the formative traditions of the Church. Ordering the Baptismal Priesthood affirms lay and ordained ministry today and proposes seven convergence points as principles to shape a theology of ordered ministries. Ordered ministry grounded in baptism constitutes a repositioning of the minister in the Church and provides a way forward in articulating a contemporary theology of ministry. Such a theology respects the role of the laity in both the spiritual and temporal orders. It offers a way to account for more stable ministry on the part of the laity who have prepared themselves formationally and professionally for service to the Church. It officially positions their contributions among recognized ministries in the name of the Church. Finally, it heals the divide that too often separates the lay and the ordained by allowing for a diversity of ordered ministries within the official ministry of the Church. Susan K. Wood, SCL, PhD, is chair of the department of theology at Marquette University,and a member of the U.S.
Lutheran-Roman Catholic Dialogue. She is the author of Sacramental Orders (2000) and and One Baptism: Ecumenical Dimensions of the Doctrine of Baptism (2009) both published by Liturgical Press. 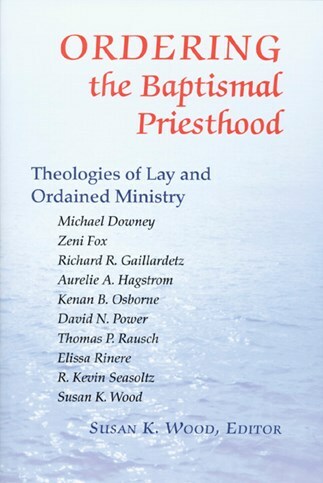 Ordering the Baptismal Priesthood is a well organized and thoughtful contribution to the contemporary understanding of ministry. This hope-filled collection of papers is an exquisite example of Catholic theology that balances our future with a reverence for our past.